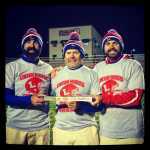 The foundation of a championship team has been laid for nearly 30 years at Linton-Stockton. Great players have strapped on the pads and helmets and donned the red and blue Miners jersey. Iconic coaches have also been in the mix over the years. But something was missing.